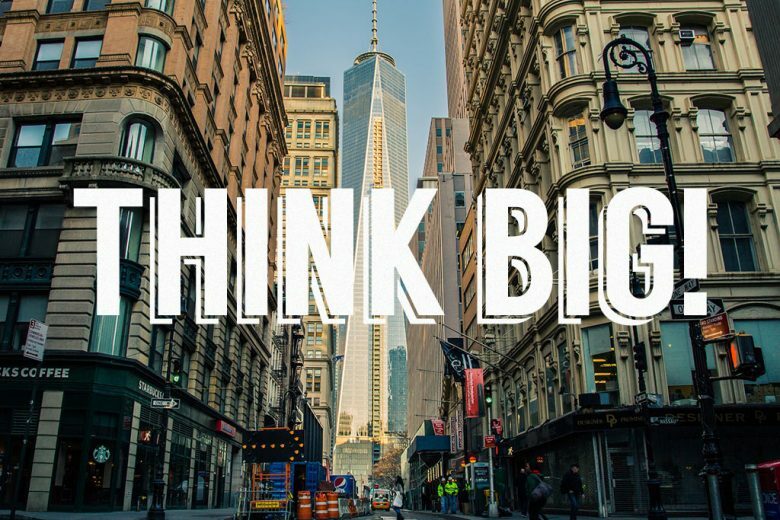 Are you afraid to think big? And how might that be limiting the amount you can achieve and earn in your life? Learn why playing bigger can open you up to more opportunities and wealth. In the sixth article in our eight-part series on loving yourself wealthy, Katie Phillips from Daring & Mighty challenges you to think about how you might be keeping yourself small, and encourages you to play a bigger game in life. Are you happy with where you are in your life? Your achievements in work and business? Your professional and personal status? The money you earn? Or do you secretly wish you could do and have more? All too often we restrict ourselves to living a smaller life than we really desire simply because we don’t dare to think bigger. We’re afraid to dream or aspire to more because we’re scared that we’ll fail or are fearful that we don’t somehow deserve it. If you don’t allow yourself to think big, then you will be in exactly the same position as you would be if you had tried and failed, but with a lot less opportunity for learning. So why not dare yourself to think big? To dream of thing things you REALLY want to do, the places you want to go and the person you want to be? And even to go one step further, to actually play a bigger game, and start to live (and grow into) the life you want? I’m playing a bigger game at the moment – next week I fly to Miami to graduate from a high level coaching certification programme, and I have gifted myself an upper class ticket! This is not simply a permission piece. My self-worth has skyrocketed through making this decision. In the past, I wouldn’t never even have dared to consider flying business class because I believed it was for ‘other people’. But recently I began to question this belief. If it makes such a difference to me, then why was business class for other people and not me? I needed to become aware of my own worth and value to be able to gift myself these flights. In short, I decided to play bigger. The opposite to playing big is keeping yourself small through your self-limiting beliefs and actions. Keeping yourself small can manifest in many ways, but nearly all of them arise from a lack of self-worth. For example, do you ever pretend not to know anything or be self-deprecating to make others feel more comfortable? Make excuses for your authentic self? Put your own needs on the ‘maybe later when I can find the time’ pile? All these actions are keeping you small. They’re limiting how others see you, but at the same time, what you believe about yourself – and therefore your potential. If you were to drop the inner struggle with you who are, and how others perceive you, and instead tap into an inner knowing of your own greatness and unlimited potential, you can live a bigger, more rewarding life instead. Setting your own value applies to your own business, or career and wealth potential too. Other people will generally only mirror what you believe of yourself, so it’s important to set your own value in terms of your own capacity to receive wealth. Believe that your work and business are valuable, and others will believe in your value too. Only then will you charge for that value and receive it. Don’t limit yourself based on what others might charge, or what others might think of you. Instead of looking to outside factors, think about how things feel from the inside. Be unapologetic about what is true for you and value your services accordingly. Eliminate words like just, little and only when talking about yourself and what you do. Dare to dream bigger in your career or business – and go for it! Talk yourself up, not down, when meeting new people. Buy yourself something from a shop or brand you desire but assume is beyond you. If you own nice clothes wear them – don’t leave them in the wardrobe waiting for the ‘right occasion’. Treat yourself to lunch in a really lovely restaurant once a week, just because. These may, at first glance, seem simple actions, but they mean a lot more. They mean that you deserve them, that you are entitled to them, that you can enjoy them. And as you start playing bigger, so your inner belief will slowly adjust. You’ll live up to the new, bigger you, and unconsciously look for opportunities that allow you to live a bigger life – and enjoy more of the lovely rewards that come with it. Three words you should never use to describe your work or business.